Who knew a city could write? Following on the heels of such literary giants as Jordan and Russell Brand, London has joined the "tell-all" game by releasing an autobiography. 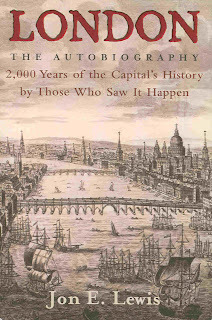 London the Autobiography is subtitled "2,000 Years of the Capital's History by Those Who Saw it Happen." Author Jon E. Lewis has combed through historical sources to find contemporary accounts of the major events in the city's history. The book begins with an account of Boudicca's sacking of Londinium in AD 60 and ends with eyewitness accounts of the 7/7/05 bombings of London by terrorists. In between are fascinating stories of London's history, including plagues, fires, rebellions, demonstrations, coronations and hangings. There are several sections of black and white drawings and photos that help to give the book more period detail. Some of the accounts in the book go on a bit too long, but for the most part, the snippets provide a fascinating insight into the history of this vibrant and ever-changing city. My favorite story? Why, the one about the construction of the building at 30 St. Mary Axe, known as the Gherkin, of course! The author of that piece, Jonathan Glancy, says that the building "deserves to be relished," and, really, who can argue with that? ?